There is a huge amount of information on this topic out there, and it creates absolute perplexity when you find 100s of remedies, to an extent that you do not even care anymore. The below article is sure to NOT confuse you, while it provides the necessary information and the solution. The under eye circles is probably the most commonly seen unwanted geometry in your face. 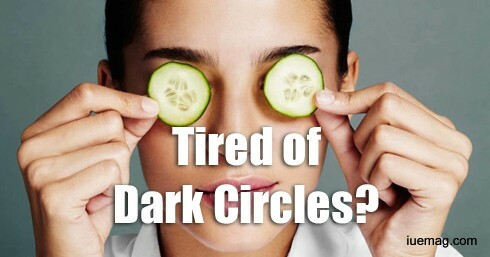 To begin with, nobody likes those dark circles which make your face look dull, tired and unhealthy and all the cons that are associated with it are a different issue to be spoken about. Unfortunately more than 60% of the population exhibit these under eye circles or dark circles in common language or even puffiness or bags around and under the eyes. Just to brief you up on this condition, the skin around our eyes is way more gentle and thinner than the rest of the face; therefore any damage around this area is very evidently seen. As a matter of fact this skin is the thinnest as compared to any part of the body at 1.5mm. Therefore it is one of the first areas to show visible signs of aging such as crow’s feet or wrinkles in simpler terms. It is almost clear that no one wants to come across as sleep deprived or dull in their day to day lives and would certainly not want these dark circles to show up. Some of the common causes for dark circles include hereditary, stress, lifestyle (such as improper sleep including over sleeping too, alcohol intake, smoking etc. ), lack of sleep (Most common cause), iron deficiency- due to which the oxygen carrying capacity to these thin tissues is reduced showing up as dark, volume loss (As you age, there tends to be a loss of fat pads on your face leaving to a depression causing darkening), allergies, trauma to the eye and others. Know the Cause! Make sure you get adequate sleep. This is the easiest thing and probably one of the best things you can gift your body. No matter how young you may be, please do not abuse your body by overworking and under sleeping. Your body is going to thank you for giving it enough rest. Secondly, application of tea bags or cucumber helps soothe the area and keep it cool. Make sure you work with your skin expert to get rid of this unwanted design. Fillers peel and certain lasers work well at the sensitive under eye areas. Besides that, maintaining a balanced lifestyle works for all age groups. Any facts, figures or references stated here are made by the author & don't reflect the endorsement of iU at all times unless otherwise drafted by official staff at iU. This article was first published here on 25th December 2016.